Why have a boring float when you can have a rodeo bull ride on float? 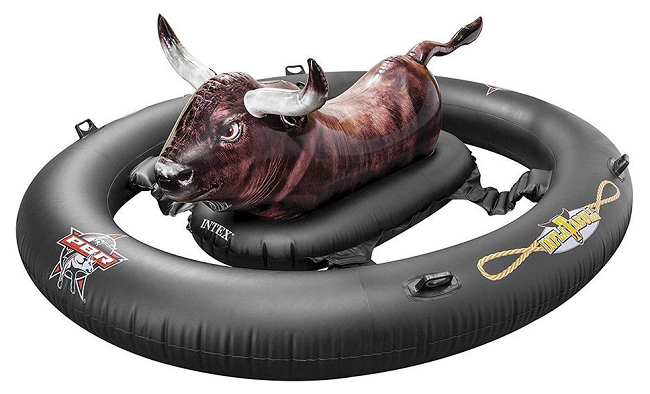 With summer right around the corner, we're keeping our eyes on the most popular pool floats and lucky for us the Inflatabull is almost half off right now at Walmart! Plus, this bad boy ships free too! While you can use this float in the pool, it'd also be great to use for trips to the Lake this summer. Its made for children and adults ages 9 and up and it looks like it'd be a blast for everyone! You'll want to hang on tight, the Inflatabull is designed so friends and family can grab a hold and shake you off while you go for a ride! What a fun and interactive pool float, why go with anything else? And at this price? Usually this is $59.99 but you'll be able to grab it now for only $40 which is a total bargain. The best part is it's a high quality pool float too, it has 3 chambers, 5 heavy duty handles and Intex is one of those brands you can trust when it comes to pool floats that'll last. Before checking out confirm the price is as listed, sometimes these sell out and Walmart shifts in a 3rd party seller so you'll want to make sure you're getting the best deal as you check out!